Our commercial grade LED light strings utilize a unique, coaxial connector that not only provides for strain relief between strings but also resists moisture from entering string connections. In addition, these LED light strings are CSA(US) rated for up to 60 strings connected to a single power source. While the coaxial connectors enable end-to-end connections, often times there are lighting implementations that require spacing between light strings, other display options besides a single string of lights, or the ability to run multiple strings back to a single power source. Our line of commercial grade LED light string accessories make all this possible. 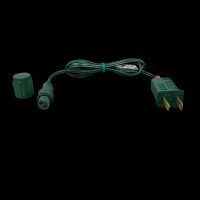 Sold separately from the light strings, the power adapter is required to connect at least one, and up to 60, commercial grade LED light strings to standard 120V power sources. It has a standard two-pronged polarized Edison style plug on one end and the coaxial-style connector on the other. The curtain assembly provides a simple means to create a curtain of light strings. It provides a single power connection and 28 drop connections for light strings. Multiple assemblies may be interconnected for longer curtain implementations. To enable flexibility and diversity in lighting applications utilizing commercial grade LED strings, we offer a variety of taps that provide for different connection options without the need to connect to power from multiple locations. With these accessories, everything from curtains of light strings to decorating a group of trees can be accomplished with a single power connection for all light strings. The 8-Way power tap provides a single power input and seven connections for light strings. This versatile product can be utilized like the hub of a wheel, enabling the light strings to branch out from a single location like spokes. 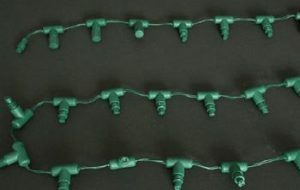 When combined with spacers, this product makes decorating a grove of trees or other closely grouped items extremely easy as it allows for 7 separate light string runs to be connected to a single power source (as long as maximum connection ratings are maintained). The “T” tap provides a single power input and two connections for light strings. Shaped like the letter “T” it gives the ability to install two light string runs in different directions using only one connection to power. The “X” tap provides a single power input and three connections for light string runs. Perfect for enabling multiple runs from a single location, it can be used in large trees or other foliage to avoid having to decorate with a single continuous run. The Drop Elbow provides a single power connection and two light string connections. Unlike the other taps, this accessory’s power connection is at a 90 degree angle from the light string connections, making it an excellent choice to use on building corners to run light strings along two sides of the structure. In many decorative and seasonal lighting applications, it is desirable to have the ability to insert a space between light strings or at the beginning of a run between the power source and where the lights begin. We provide three sizes of plain wire spacers with coaxial connections on each end that allow power to continue along a run where lights are not necessary.